Would visitors attending a convention at the Oncenter use ride sharing services like Uber and Lyft? Has the rise in residential living in downtown Syracuse grown to a level that would support car or bike sharing? These questions and more will be answered by a new study that will evaluate the potential of sustainable transportation alternatives to reduce greenhouse gases and improve the vitality of Syracuse and Central New York. “Feasibility Assessment of Sustainable Transportation (FAST): Syracuse” is a yearlong study of alternatives to single-occupancy automobiles for mobility within the City of Syracuse. FAST: Syracuse will assess the feasibility of developing, implementing, growing and promoting three urban mobility systems: 1) human-powered mobility by enhancing “walkability” and “bikeability” infrastructure in targeted areas; 2) sharing economy in the form of shared bikes and electric vehicles (EVs); and 3) improved integration with existing regional public transportation services. The first phase of the study is a survey of individuals who live and/or work in, and/or visit the city of Syracuse. Residents, workers, employers and visitors are encouraged to provide responses to a short online survey at soa.syr.edu/fast. FAST: Syracuse is being conducted by a team led by faculty members and students from the School of Architecture. The study is being done with funding provided by the New York State Energy Research and Development Authority, the New York State Department of Transportation and project partners under the Integrated Mobility Solutions for Smarter Cities and Communities program. This program seeks to promote an integrated, multifaceted, energy-efficient and sustainable transportation system through the identification of innovative strategies, policies, emerging technologies and partnerships, and through useful demonstrations and system designs that validate underutilized commercial products in New York State. The timing of this study is viewed as both strategic and historic. “Our city really is at a tipping point to become a smart, sustainable metropolitan center that will exemplify a new generation of cities, making this exciting study a bellwether for future generations,” says Tarek Rakha, assistant professor of architecture and principal investigator of the study. 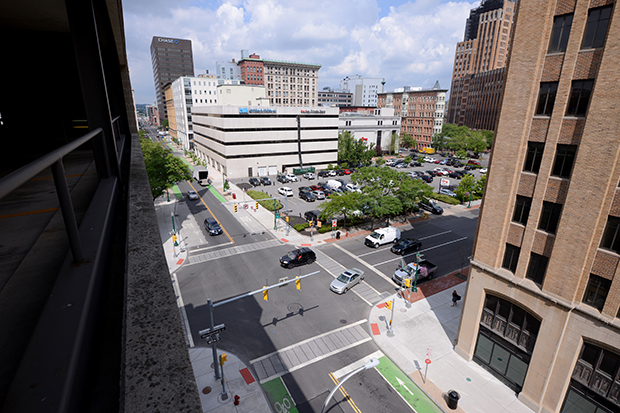 The study will consider mobility at three different scales: the “Convention District” in downtown Syracuse, the City of Syracuse and the five-county Central New York region. The Convention District includes the Oncenter, the new Syracuse Marriott Downtown, the Centro Transit Hub and surrounding blocks; it is bounded by East Adams Street, South Salina Street, East Water Street and South State Street. The area has been identified by the Central New York Regional Economic Development Council as a potential “innovation district” that includes a cluster of emerging technology innovators and entrepreneurs. In other cities, innovation districts have attracted investment in transportation and infrastructure that foster collaboration to create economic development and job growth via partnerships with higher education institutions, businesses and governments. the emergence of a nascent innovation district in the city, anchored by the Syracuse Technology Garden. 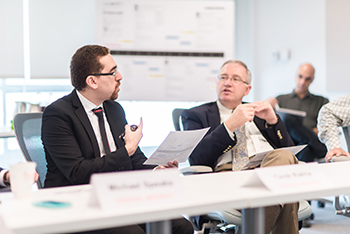 The FAST: Syracuse study will engage emerging technological approaches and commercially available technologies that are not yet widely adopted in New York. In particular, the project will use UMI—an environmental modeling tool developed by the Sustainable Design Lab at MIT—including Rakha—for use by architects and urban planners. UMI will be used to evaluate outdoor thermal comfort and its influence on neighborhood walkability within the Convention District; this will be a first-time use of this emerging urban modeling technology for a community in New York State. The project will advance new mobility designs and evaluate the feasibility of solutions that will achieve benefits including: reduction of greenhouse gas emissions; improvement in public health and well-being (achieved via increases in walking and biking) and increased innovation and entrepreneurship within the Syracuse and CNY communities via increased interactions between collaborators at innovation nodes, achieved through implementation of improved sustainable transportation alternatives. The study team includes faculty and students from the School of Architecture, faculty and staff from the Syracuse Center of Excellence in Environmental and Energy Systems (Syracuse CoE), in partnership with Syracuse engineering and environmental planning firm Barton & Loguidice, D.P.C. Team experts from Clean Communities of Central New York, CenterState CEO, Downtown Committee of Syracuse and Hitachi Consulting help to round out this comprehensive effort.